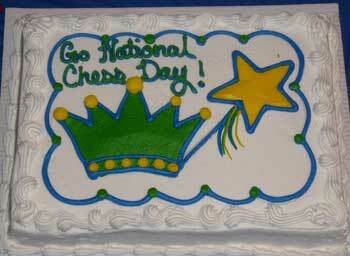 The United States Chess Federation - National Chess Day Parties Kick Off! Home Page Chess Life Online 2010 October National Chess Day Parties Kick Off! Clubs all over the USA celebrated National Chess Day with parties and chess tournaments, including the Chicago Chess Festival which featured a proclamation by mayor Richard M. Daley. 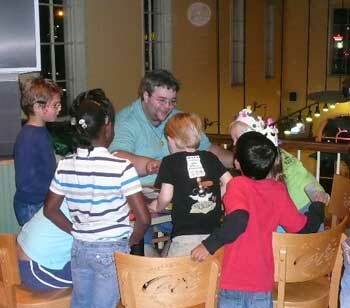 Check out some of the fun in the first of several National Chess Day round-ups on CLO. Meanwhile, drama heightens at the Continental Class Championships in Arlington, Viriginia. After five rounds, five GMs, Alexander Stripunsky, Giorgi Kachieshvili, Akelsandr Lenderman, Alexander Ivanov and Eugene Perelshteyn and one FM, Erik Santarius are tied for 1st with 4/5. Watch key games unfold on Monroi.com and look for a full report by GM Kaufman. The US Armed Forces Open in also in full swing at Andrews Air Force Base. Also in attendance was USCF board member Michael Atkins, who was integral in getting the resolution to declare NCD an official holiday (see the PDF of the Senate Resolution here). 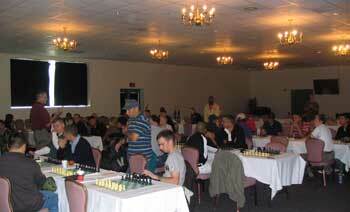 Atkins wished the players a Happy National Chess Day, and he took the following shot of the tournament hall. Memphis, Tennessee got into the National Chess Day spirit with a full weekend of chess-filled excitement, starting with the Chess Day-Eve Party! 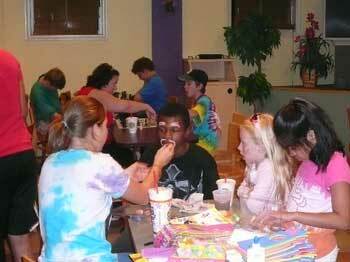 With Face Painting, Carnival Games, plenty of Cake & Prizes-everyone wanted to come out and play. Shelby County Chess along with Cajun Chess sponsored the festivities, and chess fanatics from ages five to sixty-five could be faced with a new opponent in the quick chess tournament, become a pawn-eating tiger, or join in a chorus that was supposed to be "Happy Chess Day" that somehow became "Happy Birthday, Chess!" On National Chess Day Chicago was blessed with a warm and sunny day while Renaissance Knights Chess Foundation held the inaugural Chicago Chess Festival at Wilbur Wright College. There were a total of 42 participants ranging from first time tournament players to players with more than 30 years of tournament experience. 21 Chicago Public School students were provided with free entry from Renaissance Knights Chess Foundation, 15 of who had never played in a USCF rated event before. 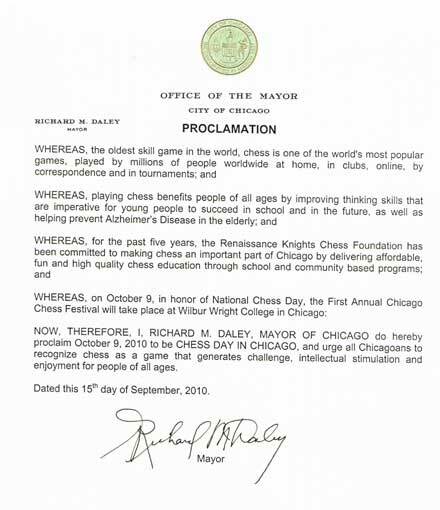 This was a special day for chess in Chicago as Chicago Mayor Richard M. Daley had proclaimed October 9th as Chess Day in Chicago. Mayor Daley has been a long time supporter of chess programs in Chicago and in December Renaissance Knights Chess Foundation sponsors an annual Chess Tournament named after him. The competition was fierce going into the last round, but only one player emerged at the top of each section taking clear first place. Top honors went to Vishal Chandrasekar in the K-2 section with 4 point, Ricky Wang in the K-5 section with 4 points, Aman Grover in the K-8 section with 4 points, and up and coming Steven Matthew in the Open section with 3.5 points Congratulations to all of our winners! We celebrated our Grand Opening yesterday with a bang! At 10:30am Skokie Mayor, Mr. George Van Dusen, cut the ribbon marking a new day in the life of those in the Village of Skokie and also in the chess community. Over 30 people cheered on and the festivities continued from there. Grandmaster Mesgen Amanov took on all comers in a 21 board simul and even satisfied those that came in late allowing them an opportunity to participate in our beloved mind sport. GM Amanov bulldozed the competition with a score of 20-1-0 (20 wins, 1 draw, no losses). After a short (very short) intermission, we began our Game 15 quick rated tournament which was played in a single open section so even the lower rated players could take on stronger competition. Matt Pullin of Evanston took home first place with a perfect score of 4-0. The tournament was rated before midnight last night. Finally FIDE Master Gauri Shankar and his older brother International Master Arjun Vishnuvardhan gave a group lesson using our newly installed 50" Plasma TV's and wireless video broadcast system. They reviewed two of their critical games from this seasons Chicago Blaze chess matches. To top everything off, the Chicago Tribune was present and provided immediate coverage! Check out the article at the Chicago Tribune. On Sunday October 10 beginning at 1pm we will host a 4R-SS Game/30 + 30/sec increment tournament. USCF membership will be required. The address of the North Shore Chess Center is 5500 West Touhy Ave Suite A, Skokie, IL 60077. You turn on Linder Street from Touhy. The parking lot entrance is on Linder, but the Chess Center faces Touhy. We are directly across the street from Pet Smart. We are about 3 blocks west of the Holiday Inn on the same side of the street.